Admittedly, most of what I've had to say lately regarding animation coming out of Disney has been pretty critical. I make no apology for that, as I feel they should not be above criticism when I feel it's warranted. However, a couple days ago I came across something that I suspected I wouldn't care for, yet imagine my surprise when I actually found it to be quite charming! 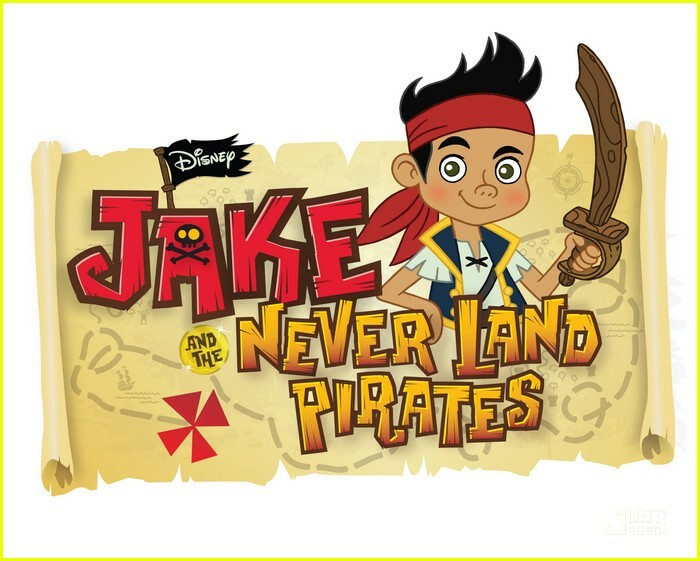 It's a new TV series called Jake and the Neverland Pirates, which apparently has recently premiered on the Disney Junior block on the Disney Channel in the U.S. Several episodes have been posted on YouTube for viewing, and I must say that from a visual standpoint anyway, the show looks very impressive. I'm actually aghast at how good the animation looks, both appealingly designed and fluidly animated. In short, it looks better than most TV animation and almost approaches (but not quite) feature quality, though that quality is somewhat deceptive in that it is still being done using a type of "symbol" animation (I believe), yet in a far more sophisticated manner that mimics full keyframe animation. 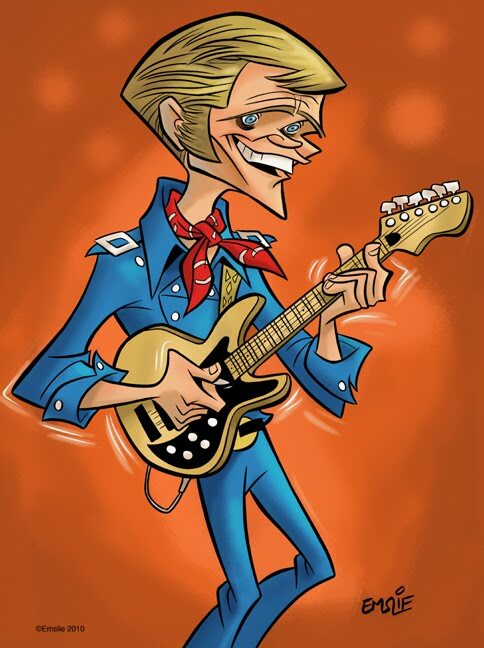 According to this site, someone named Clint who would appear to be involved in its production, claims that the animation technique is created through a combination of using ToonBoom Harmony and Maya software. What's incredible to me is how much it resembles traditional handdrawn animation, while apparently not utilizing that process at all! Additionally, the series boasts some intelligent art direction, with pleasing visual design in a colour palette that is rich without being gaudy. I was also pleasantly surprised to learn that this series has been produced at Mercury Filmworks, back in my hometown of Ottawa. Although the series is certainly aimed at the pre-school set, there's some fun, cartoony characterization, and, while they've been redesigned in a less threatening, kid-friendly style, I surprisingly don't even have any major objection to the way that Captain Hook and Mr. Smee are portrayed in the show. The voice work is very true to the original characters and, despite their makeover, I think the integrity of their personalities has remained intact. All in all, I think this is a nice little series that I can see young kids quite enjoying. For me, it's a big step up from the CGI look of Mickey and friends in Mickey Mouse Clubhouse, a show that I frankly find hard to look at. 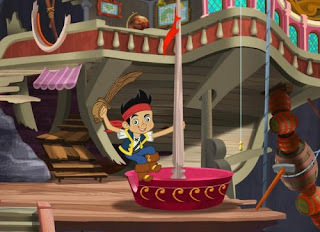 With Jake, it seems like Disney is trying to be more faithful to its traditional animation roots, even if it's been simulated through the use of new technology. So, a big congrats to all involved in creating each episode of Jake and the Neverland Pirates - it looks great! By the way, if anybody from Mercury would like to give more background to the production process, please feel free to do so in the comments section. Thanks! I liked the rhinestone encrusted leisure suits and big sideburns that all the guys sported during that era, and the big hairdos and sequins on all the gals. 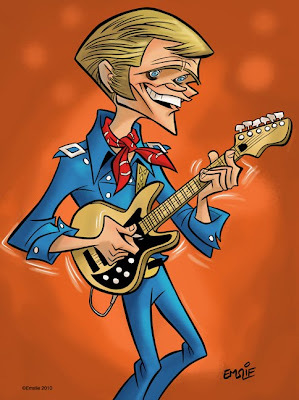 My favourite entertainers on the Nashville scene were the crazy rascals like Ray Stevens, Roy Clark, and especially Roger Miller and this good ol' boy from Atlanta, Georgia... Jerry Reed. I think I really took to him in a big way when he co-starred alongside Burt Reynolds in 1977's Smokey and the Bandit, still one of my all-time guilty pleasures. Jerry played Bandit's trucker buddy, Cledus Snow, who went by the CB handle, "Snowman". He wrote and performed a number of songs for the movie's soundtrack, including the infectious, "Eastbound and Down", featuring Jerry's own special brand of manic guitar pickin'. You can see him playing a rousing version of the song in this video clip from the TV special, Nashville Salutes America. In fact, it was from this particular performance that I sketched the caricature pictured above. Something a little different on Caricaturama Showdown this week. Instead of a single celebrity as the subject, it was decided to allow the members to draw anybody famous of Japanese heritage as a small tribute to the people of Japan in this time of great catastrophe. I figured there'd be some caricatures drawn of actor Toshiro Mifune and animation director Miyazaki, so I was looking for somebody that I didn't think would be as obvious a choice by other members. 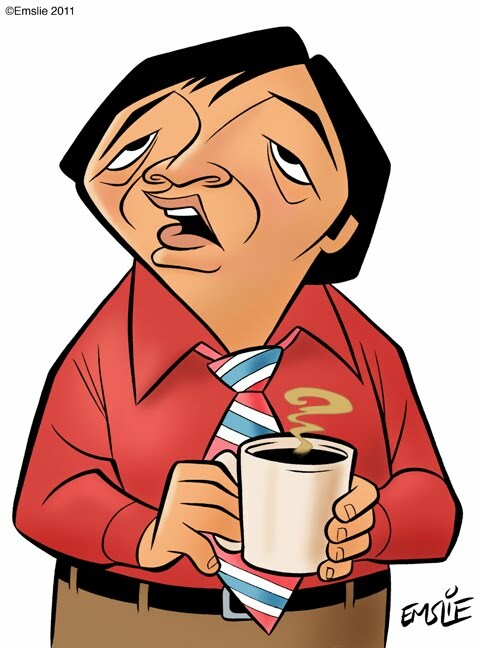 I decided to go with the comic actor, Jack Soo, a Japanese American who was most well-known for portraying Detective Nick Yemana on the 1970's cop sitcom, Barney Miller. As fans of that great show will recall, Yemana was renowned for brewing up his awful coffee that nobody else particularly wanted to drink. Here's a selection of quick scenes from various Barney Miller episodes. I actually remembered that second clip involving the coffee made from rainwater from when it first aired! Yemana and Wojo were my favourite characters on the show, although the entire ensemble cast was quite brilliant. 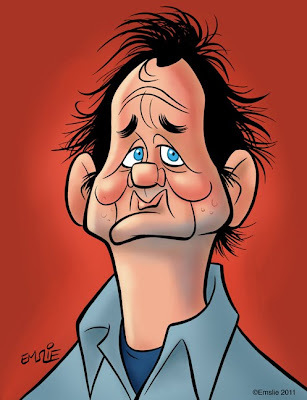 Here's this week's entry in the Caricaturama Showdown 3000: my caricature of comic actor, Bill Murray. As comedians go, I admire Bill Murray for balancing out his slick commercial comedies with some very interesting arthouse films. Unfortunately, the only Bill Murray film I have in my DVD collection is the combination live action/animation feature, Osmosis Jones. While the bulk of the film is brilliantly animated and a clever satire on the way the human body functions (directed by Tom Sito and Piet Kroon), the live action sequences directed by the Farrelly Brothers are pretty godawful, with poor Bill Murray playing the part of a disgusting slob with a lot of gross-out humour. Not one of his better career moves, I'm afraid.